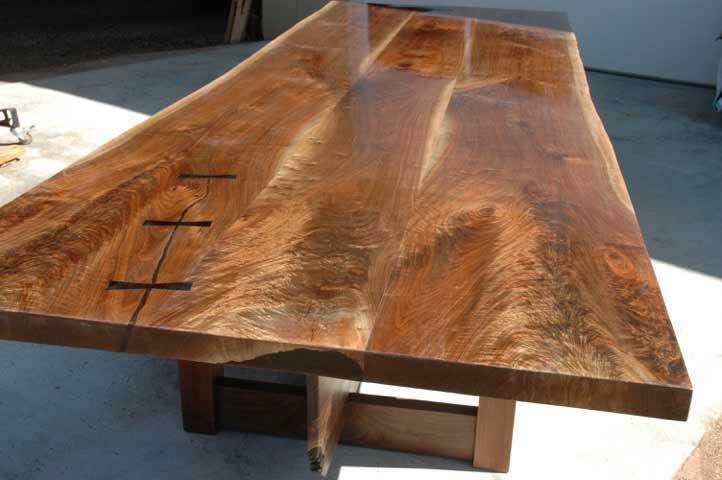 Handmade Wood Slab Custom Boardroom Tables made with beautiful natural edges and organic shapes. These custom boardroom tables are handcrafted from EXCEPTIONAL HANDPICKED WOODS!!! When only the BEST will do!!!! Find the perfect piece for your office today!!! SOLD! But have another identical slab from the same tree. Could make another table that looks just like this. Book matched from urban trees in Maryland. Amazing grain on this Table. Many other handmade custom boardroom tables available. Call to learn more! Custom Walnut Slab Boardroom Table with Walnut Slab Base. Approximately 9′ long x 32/36″ wide. 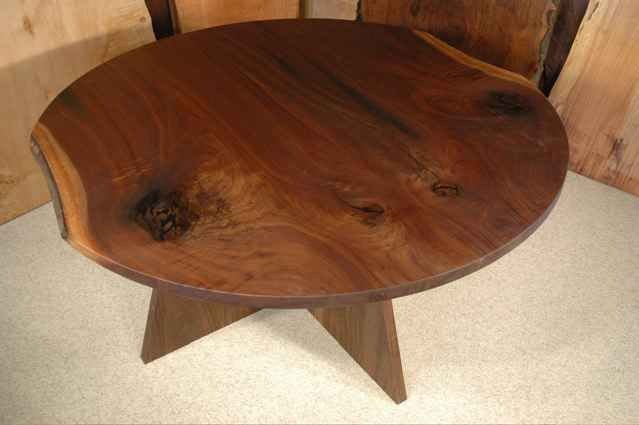 5′ “Boettcher” Round Walnut Table Custom Made. 7′ x 40″ wide Quilted Maple Custom Table with Cherry and Curly Maple Base. Unique handmade custom boardroom tables made from reclaimed and recycled woods. The “Welch ” 5′ x 5′ Custom Walnut Slab BoardroomTable. Approximately 7.5′ x 32″ wide- Custom Walnut Crotch Slab Boardroom Table. 1″ Table D.
This Curly Redwood Custom Boardroom Table would fit well in a corporate boardroom. We build each of our custom boardroom tables by hand. Call for pricing or click the request a quote button! 10′ Modular 2 Piece Maple Custom Boardroom Table With Walnut Pedestal Bases. The “Lieberthal” Custom Bookmatched Cherry Boardroom or Conference Table. 10.5′ long x 32″/40″ wide. Cherry slab custom boardroom tables and corporate conference tables made to order from unique and unusual live edge wood slabs. The “Binder” Custom Walnut Boardroom Table with natural edges and organic shape. 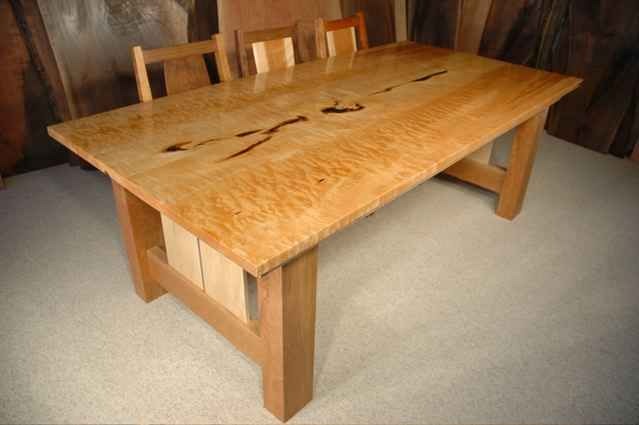 Cherry and birdseye maple custom boardroom or conference table with boat-shaped, expandable top. Cherry custom boardroom tables made to order from unique and unusual live edge wood slabs. 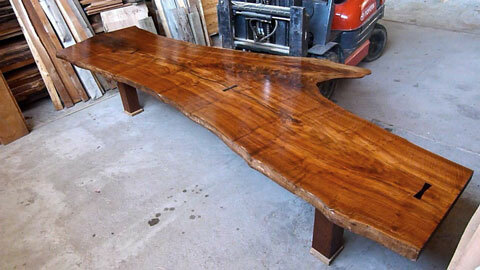 Highly figured Siberian elm slab custom boardroom table with double hand hewn block base. Many Unique, Unusual, One of a kind, Custom boardroom tables in stock. This 10 foot natural edge organic custom boardroom table is supported by two salvaged steel i-beams. The live edged maple slab dining table has two ebony butterflies. 10′ Maple Burl Custom Boardroom Table with natural edges and Salvaged Steel Base. Natural edge curly maple burl with salvaged steel base from our local steel recycling center. From the end of a 16’ long top that went to the Hampton’s. It is extraordinarily beautiful. We build each of our custom boardroom tables by hand from solid wood slabs. Ask today about some of our unique styles. 20 feet long, 6 inches thick and 4 feet wide weighing approximately 2000 pounds. The growth rings on this Redwood slab equals aproximately 500 years old. We put this amazing Redwood slab on three stainless steel bases. Call us today for a quote on a wood slab table to meet your needs. Triple walnut crotch slab table top. The grain is what you would expect to see on musical instruments. It is one of the most beautiful walnut grain we have ever seen. This Walnut slab table top was fit with a Claro Walnut slab base. Call us for additional photos and a quote made especially for you. 11’8″ L x 48″ W x 30 “H x 2” Th. We put this Burl Maple on a few different salvaged steel bases so you can see some of your options. This is a special Ginko slab table top on spalted Fir Cant base. 16 feet long, 3 – 4 feet wide and 2 inches thick. This claro curly walnut slab table top is from California. We put some Ebony butterflies in the top for added style. This walnut is one of the most beautiful we have ever seen.